Arefnejad, B., Mehdizadeh, Y., Javanmard, A., Zamiri, M., Niazi, A. (2018). Novel Single Nucleotide Polymorphisms (SNPs) in Two Oogenesis Specific Genes (BMP15, GDF9) and Their Association with Litter Size in Markhoz Goat (Iranian Angora). Iranian Journal of Applied Animal Science, 8(1), 91-99. B. Arefnejad; Y. Mehdizadeh; A. Javanmard; M.J. Zamiri; A. Niazi. "Novel Single Nucleotide Polymorphisms (SNPs) in Two Oogenesis Specific Genes (BMP15, GDF9) and Their Association with Litter Size in Markhoz Goat (Iranian Angora)". Iranian Journal of Applied Animal Science, 8, 1, 2018, 91-99. Arefnejad, B., Mehdizadeh, Y., Javanmard, A., Zamiri, M., Niazi, A. (2018). 'Novel Single Nucleotide Polymorphisms (SNPs) in Two Oogenesis Specific Genes (BMP15, GDF9) and Their Association with Litter Size in Markhoz Goat (Iranian Angora)', Iranian Journal of Applied Animal Science, 8(1), pp. 91-99. Arefnejad, B., Mehdizadeh, Y., Javanmard, A., Zamiri, M., Niazi, A. Novel Single Nucleotide Polymorphisms (SNPs) in Two Oogenesis Specific Genes (BMP15, GDF9) and Their Association with Litter Size in Markhoz Goat (Iranian Angora). Iranian Journal of Applied Animal Science, 2018; 8(1): 91-99. BMP15 and GDF9 are two oogenesis specific genes play a pivotal role in female fertility in mammals and potential for improvement of prolificacy in marker-assisted selection. The aim of present research was to investigate the variation and association between BMP15 and GDF9 polymorphism and litter size in Markhoz goats. The sequence variability of the different amplified fragments utilized for genotyping was further investigated by polymerase chain reaction-restriction fragment length polymorphism (PCR-RFLP), polymerase chain reaction-single strand conformation polymorphism (PCR-SSCP) and sequencing. Sequencing technology allowed the detection of two nucleotide variations: A both non-functional mutation (G/A) transition at nt 1026 known as P3) and a synonymous mutation at 1049 position which for the first time was found at the BMP15 gene. Also, GDF9 gene exhibited a polymorphism on BcnI site (1159 bp) within exon 2 of amplified PCR products (glutamine/proline). Our analysis using general linear model (GLM) statistical methods showed litter size was significantly influenced by genotypes of GDF9 (P<0.01). Heterozygous genotype showed higher litter size than homozygous genotypes (P<0.01). The conformation of this founding would need large sample size and test to screen in other indigenous goats. Iran is believed to be one of the main gateways for domestication of sheep and goat in the world. Despite of this fact that more than 25 million individual goats from 20 breeds of goats have been recognized in the country, only eight of these breeds classified as typical breeds (Tavakolian, 2000; Arefnejad, 2007; Rashidi, 2000). Markhoz goats are an interesting genetic material due to their considerable twining percentage (25 percent) and a rare set of triplet type of birth phenomena in the herds (Rashidi, 2000). Historically, Markhoz goat was scattered in the provinces of Western Azarbaijan, Kurdistan, and Kermanshah; however, it is currently distributed only in a small part of Kurdistan and a few villages of Western Azarbaijan provinces (Rashidi, 2000; Farshad et al. 2008). To stop the declining trend of the Markhoz breed, the benefit of breeding for increased fertility/litter size as a fundamental step to conserve indigenous breeds is paramount (Javanmard et al. 2011; Tavakolian, 2000). But, how precisely reproductive traits such as litter size is controlled remains a critical and important question in reproductive biology and is the major goal of research at this moment (Abdel-Rahman et al. 2013; Farshad et al. 2008). In mammals, the ovulation rate and the litter size is a result of well regulated interactions of endocrine and paracrine mediators (Silva, 2005). The number of mature oocytes released during one reproductive cycle and estrous is determined by complex exchange of endocrine signals between the pituitary gland and the ovary as well as the paracrine and autocrine signals within ovarian follicles involving the oocytes and its adjacent somatic cells (Knight and Glister, 2003). The BMP15 is a growth factor and a member of the TGFß super-family that is specifically expressed in oocytes (Abdel-Rahman et al. 2013). This gene regulates granulosa cell proliferation and differentiation by promoting granulosa cell mitosis and suppressing follicle stimulating hormone receptor expression, all of which play a pivotal role in female fertility in mammals (Hanrahan et al. 2004). The BMP15 gene has been mapped to sheep chromosome X and contains 2 exons. Investigation on mutations for this gene in sheep showed that the same phenotype: homozygous carrier ewes are sterile but heterozygous carrier ewes had elaborated ovulation rate (Ahlawat et al. 2013). Ovine GDF9 spans approximately 2.5 kb and contains two exons and one intron. Exon 1 spans 397 bp and encodes for amino acids 1-134, while exon 2 spans 968 bp and encodes for amino acids 135-456. The single intron spans 1.126 bp. In vivo changingof GDF9 concentration led to incremental changes in ovulation rate in sheep (Hanrahan et al. 2004; Chu et al. 2011). The BMP15 and GDF9 fecundity alleles show an X-linke and an autosomal over-dominant inheritance pattern with infertility in homozygous females (Ahlawat et al. 2013). 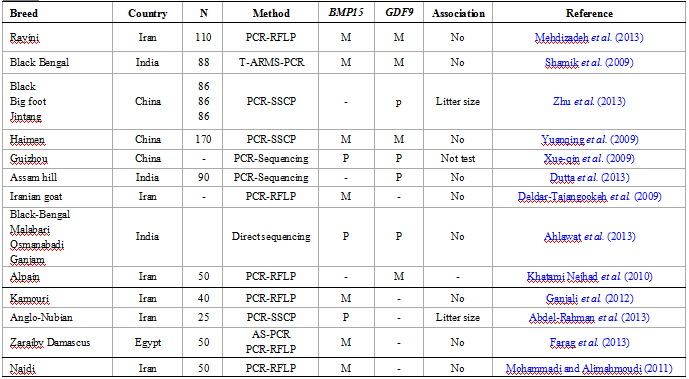 Despite of this, there is little information concerning the BMP15 and GDF9 genes in Iranian indigenous goats. Thus, the genetic basis of caprine prolificacy remains to be explored. Based on the above considerations, the present study pertains to molecular characterization and screening of novel polymorphisms within prolificacy associated BMP15 and GDF9 genes and their association with litter size in Markhoz goat breed. To explore the genetic variations within investigated candidate genes, a total of 120 mature Markhoz does with known pedigree information and litter size records at first kidding from two groups of Animal Husbandry Research Station (n=82) and around rural zones (n=38) were randomly selected based on phonotypical variation of prolificacy, geographical distribution and age of does. The does were managed for once a year kidding and were routinely bred to bucks through natural mating following heat detection. At the start of the breeding season, the doses were randomly mated with bucks and were not under any hormone therapy or synchronization of estrus using controlled internal drug releasing (CIDR) or flushing methods. Natural pasture was the main source of feed. The quantity and quality of the pasture vary considerably during the year. With the dry season and with decreasing in the quantity and quality of the pasture, supplemental feeding was provided. All procedures involving animals were approved by the animal care and use committee at the respective institutions where the experiment was conducted. Blood samples were collected from the jugular vein of 120 mature female goats supplemented with 0.5 M ethylenediaminetetraacetic acid (EDTA) (pH=8). All samples were delivered back to the laboratory in an ice box and stored in the laboratory freezer at −20 ˚C. Genomic DNA was isolated from frozen whole blood cells by using commercial genomic DNA extraction Kit (QIAGEN, Australia). Quality and purity of the entire extracted DNA was assessed using agarose gel electrophoresis (0.8%) and calculating the OD260/OD280 nm ratio determined with the Nanodrop (ND1000). The molecular analysis consisted of amplication of BMP15 and GDP9 fragments by PCR, followed by detection of polymorphisms by single-strand conformation polymorphism (SSCP), verification of single nucleotide polymorphisms (SNPs) by sequencing, and finally statistical analysis of SNPs. New primer sets designed for both genes according to coding region and most variable region of investigated genes in previous reports and available information of NCBI. The sequences of the forward and reverse primers for the amplification of the GDF9 and BMP15 genes are given in Table 1. The PCR was performed in a 25 µL reaction using the master mix kit (Fermentas, Russia) in a T-Personal thermo-cycler (Biometera co., Germany). The PCR mixture contained: 50–100 ng of DNA, 2.5 μL of 10 X PCR buffer (200 mM (NH4)2SO4, 0.1 mM Tween 20%, 750 mM Tris–HCl (pH 8.8), 2.5 mM MgCl2,200 μM dNTPs, 3 μL mix of oligonucleotids (10 pmol of each primer), 1 U Taq DNA polymerase (Dream Taq polymerase, Fermentas company) and 11 μL ddH2O. A total of 35 cycles was adapted for denaturation at 94 ˚C/1 min, annealing were variable depend on primer sequence and polymerization at 72 ˚C/2 min. The SSCP methodology, for amount of PCR product, denaturing solution, acrylamide concentration, presence or absence of glycerol and running temperature at 4 ˚C and 20 ˚C, was optimized for each PCR product. Each PCR reaction was diluted in denaturing buffer (95% of formamide, 10 mM NaOH, 0.05% xylene cyanol, 0.05% bromophenol blue and 10 mM of EDTA), denatured at 95 ˚C for 10 min, cooled snap on ice and loaded on polyacrylamide gel (Wang et al. 2011). The PCR fragments were analyzed in polyacrylamide gels 37.5:1 acrylamaide-bisacrylamaide (6% for SSCP-P1, 10% for SSCP-P2 and 8% for SSCP-P3 PCR products) without glycerol and with migration at room temperature with 80-120 V and 6 h. Subsequently, silver staining performed to detect the bands (Zhang et al. 2008). The size of the alleles was determined based on a 100 bp DNA size standard (Fermentas company) using the computer software BIO 1 D++. For those loci showed polymorphism in pattern of bands, each pattern was a candidate for sequencing in the next step. For sequencing and mutation detection, the resulting PCR products were analyzed by agarose gel and then, purified by AccuPrep® PCR Purification Kit of BIONEER. Because of a small range of PCR products only forward sequencing was conducted for each PCR product. The PCR products were sequenced by Macrogen company and significant results submitted to the Genbank (Accession num ber is: EU095935. 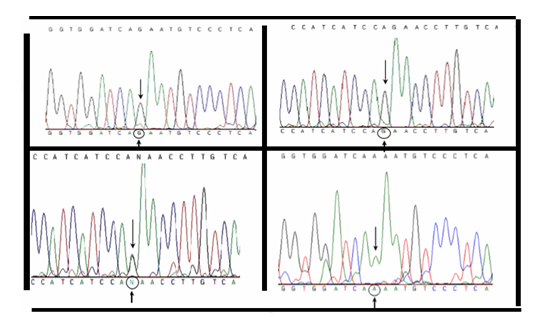 The sequence alignment was performed using BLAST and MAFFT and CLUSTW online multiple alignment tools (www.ebi.ac.uk). Electropherogram of raw sequence data gives us information on the length of the read and the height of the peaks which determines whether or not the peaks are within acceptable heights and peak resolution, uniform peak spacing and has a weak background noise in comparison for evaluation of quality of raw data. For confirmation of the single base substitutions at the nucleotide position 1100 by sequencing genomic DNA covering the whole mature peptide coding region, a PCR-RFLP DdeI restriction enzyme (CTNAG cleavage site) was used for FecXB polymorphic loci. After amplification of the 153 bp DNA fragment, restriction digestion of 8 µL of PCR product with 1 U DdeI and 2 µL enzyme buffer in 20 µL final volume was performed for 6 h at 37 ˚C. With direct sequencing of GDF9-ex2 to find new mutations we have identified a non-conservative substitution at nucleotide position 959. 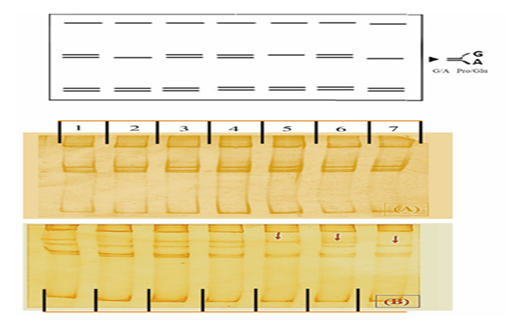 Restriction digestion of 8 µL of PCR product with 1-U BcnI and 2 µL enzyme buffer in 20 µL final volume was performed for 6 h at 37 ˚C. Allele frequencies, most frequent allele, Hardy-Weinberg equilibrium test, observed and expected heterozygosity and average heterozygosity were calculated using POPGENE software (Version 1.3) (Yeh et al. 1997). The allele binning procedure was used for minimizing of genotyping error and validity of raw data. The statistical model fitted to evaluate the association of the genotypes of each gene and litter size included the fixed effects of the herd, parity, and birth year, random effect of sire and dam of kids. The reason of choosing birth year as fix effect is due to variations in the environment, management methods, feeding programs, and body condition of the dams. The two-way interactions between the fixed effects, effects of age of the dam as covariate were also included in the model. The data were analyzed by generalized linear mixed model (GLM) procedure of SAS (SAS, 1999). Mean allele class differences for the litter size traits were compared and then evaluated with Bonferroni correction post-hoc tests. In this study, we investigated the pattern and variability of GDF9 and BMP15 gene and their association with fecundity of Iranian native Markhoz goat. We hypothesized herein that the variation of the litter size in Markhoz goat mostly related to novel and unique specific SNP in this breed and therefore, we did not use the reported polymorphism in other exotic or indigenous sheep/goat breeds for evaluation of fecundity in this indigenous breed. 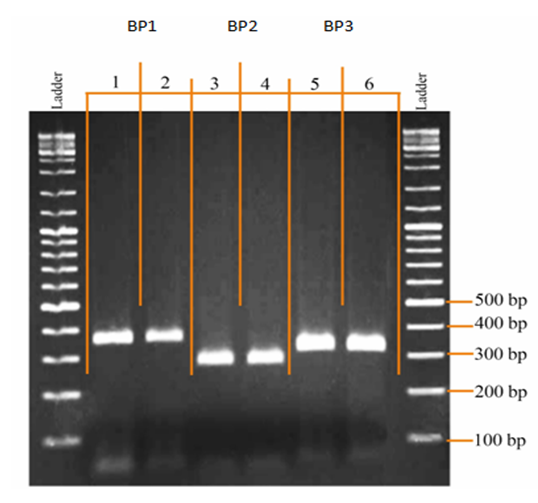 The Figure 1 indicated quality of PCR products of BMP15 exon 2 different gene loci. Colum 1, 2 is BP1 (353 bp), Colum 3, 4 is BP2 (273 bp) and 5, 6 Colum is BP3 (312 bp). The SSCP analysis identified three conformational differences in the BP3 fragment (312 bp). But, no conformational patterns were detected for BP1 and BP2. The sequence variability of the different amplified fragments utilized for genotyping was further investigated by PCR-RFLP, PCR-SSCP and sequencing. Sequencing technology allowed the detection of two nucleotide variations: a both non-functional mutation (G/A) transition at nt 1026 known as BP3) and a synonymous mutation at 1049 position for the first time was found at the BMP15 gene (Figures 3 and 4). PCR-SSCP analysis within the 312 bp fragment of GDF9 identified three conformational differences in GP3 fragment but no conformational patterns were detected for GP1 and GP2. Also, GDF9 gene exhibited a polymorphism on BcnI site (1159 bp) within exon 2 of amplified PCR products (glutamine/proline). PCR-RFLP using DdeI within FecXB locus showed no polymorphic results for whole genotyped animals. GDF9-ex2 primers amplified 1169 bp of exon 2 and PCR product digested using BcnI which showed three genotypes. Analysis of PCR-RFLP for GDF9 showed one polymorphic BcnI site in the 1169 bp PCR product within exon 2 of GDF9 gene (Figure 4). 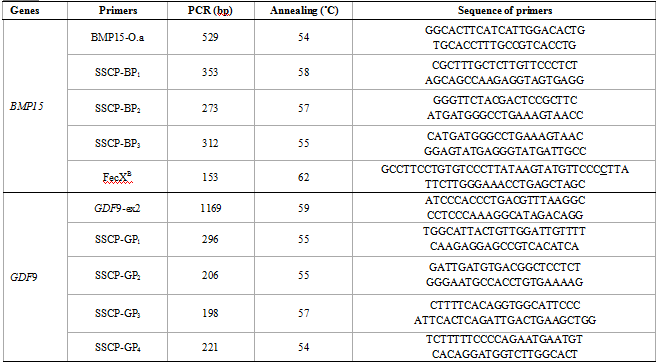 The digested (-/-) PCR product exhibited one fragment of 1169 bp and for the (+/+) PCR product (Mutant type), the 1169 bp fragment was cleaved into two fragments of 690 and 479 bp (wild type). 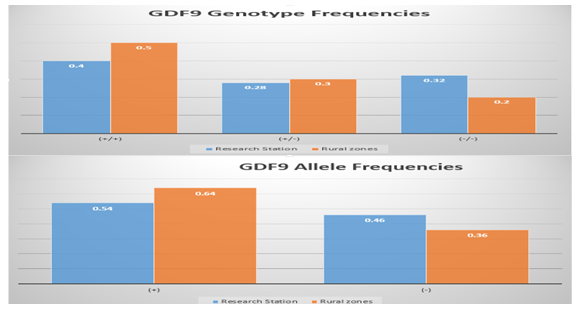 The frequency for the BcnI (-) alleles was 0.46 and 0.36 in the does from research station and rural zones, respectively. The allele frequencies between two groups was significantly different (P<0.05) (Figure 5). This mutation leads to substitution of a polar amino acid (glutamine) with a non-polar amino acid (proline). It seems that this mutation changes the structure and function of the GDF9 protein. Litter size was significantly influenced by genotype of the does for GDF9 (P<0.01). Heterozygous genotype showed higher (LSM±SE) litter size than homozygous genotypes (P<0.01) in rural zones (2.66±0.34 vs. 1.30±0.18) and research station (2.41±0.15) (Table 2). Table 3 shows brief summary and comparison of our reports with similar study on fecundity candidate genes in goats. The reports of most of the similar works on monomorphic pattern of their indigenous goat breeds were in contrast of the present findings (Mehdizadeh et al. 2013; Shamik et al. 2009; Yuanqing et al. 2009; Deldar-Tajangookeh et al. 2009; Khatami Nejhad et al. 2010; Ganjali et al. 2012; Farag et al. 2013; Mohammadi and Alimahmoudi; 2011). Despite of this, our results are consistent with findings from earlier work on discovered polymorphism within the present candidate gene (Zhu et al. 2013; Xue-qin et al. 2009; Dutta et al. 2013; Ahlawat et al. 2013; Wang et al. 2013). As logic, justification, the reason for a difference in the present result with other findings seems particularly due to different population and geographical and even more by technical staff, which may influence the analysis (Kasiriyan et al. 2011). There are limitations in this study. To better understand how the ovary system organizes and coordinates fecundity during pregnancy, examination of single candidate gene polymorphism results alone may not be sufficient. This result is reasonable given that novel polymorphism, which can influence the primary function of the ovary during early pregnancy. This study is groundwork for future investigations evaluating of fecundity rate in this specific indigenous goat breed. This present study demonstrated the designing specific primers based on caprine genome could preferable than using ovine primers and known SNPs for re-confirmation purpose in goat species. P: polymorphic pattern; M: monomorphic pattern and No: association study not done. The sequence variability of the different amplified fragments utilized for genotyping was further investigated by PCR-RFLP, PCR-SSCP and sequencing in this study. Sequencing technology allowed the detection of two nucleotide variations, A both non-functional mutation (G/A) transition at nt 1026 known as P3) and a synonymous mutation at 1049 position, for the first time at the BMP15 gene. Also, GDF9 gene exhibited a polymorphism on BcnI site (1159 bp) within exon 2 of amplified PCR products (glutamine/ proline). The litter size was significantly influenced by genotype of the does for GDF9 (P<0.01). Heterozygous genotype showed higher litter size than homozygous genotypes (P<0.01). The BcnI polymorphism within Markhoz GDF9 exon 2 gene could be further evaluated for use in marker assisted selection in litter size and fertility improvement of this breed. However, future investigations into the limitations research and any other research questions to improve our knowledge are necessary. The author acknowledges the encouragement received from department scientific colleagues, in Kurdestan University. Our deeply appreciation also goes to Faculty of Agriculture, university of Shiraz and Gene Bank Laboratory, environmental protection organization for preparation of the blood samples. The visited farmers kindly allowed us to sample their sheep and warmly welcomed for assistance. This work was implemented in the Agricultural Biotechnology and Plant Virology Departments of Shiraz University. Abdel-Rahman S.M., Mustafa Y.A., AbdErrasool H.A., El Hanafy A.A. and Elmaghraby A.M. (2013). Polymorphism in BMP15 gene and its association with litter size in Anglo-Nubian goat. Biotech. Anim. Husb. 29(4), 675-683. Ahlawat S., Sharma R. and Maitra A. (2013). Screening of indigenous goats for prolificacy associated DNA markers of sheep. Gene. 517(1), 128-131. Arefnejad B. (2007). Molecular analysis of BMP15 (bone morphogenetic protein-15) gene in Markhoz goats. MS Thesis. Shiraz Univ., Shiraz, Iran. Chu M.X., Wu Z.H., Feng T., Cao G.L., Fang L., Di L., Huang D.W., Li X.W. and Li N. (2011). Polymorphism of GDF9 gene and its association with litter size in goats. Vet. Res. Commun. 35, 329-336. Deldar-Tajangookeh H., Zare Shahneh A., Zamiri M.J., Daliri M., Kohram H. and Nejati-Javaremi A. (2009). Study of BMP15 gene polymorphism in Iranian goats. African J. Biotechnol. 8(13), 2929-2932. Dutta R., Das B., Laskar S., Kalita D.J., Borah P., Zaman G. and Saikia D.P. (2013). Polymorphism, sequencing and phylogenetic characterization of growth differentiation factor 9 (GDF9) gene in Assam Hill goat. African J. Biotechnol. 12(50), 6894-6900. Farag I.M., Abd El-Aziz K.B., Ahmed E.S., Abdelsalam A.Z.E., Soliman K.A., Darwish A.M.M. and Abu Shady A. (2013). Polymorphism of BMPR1B, BMP15 and Beta casein genes in two of Egyptian domestic goats. J. Appl. Sci. Res. 9(4), 3199-3211. Farshad A., Akhondzadeh S., Zamiri M. and Sadeghi G. (2008). The estrous cycle of the Markhoz goat in Iran. Asian-Australasian J. Anim. Sci. 21, 1411-1415. Ganjali H., Mohammadi G., Gallehdari H. and Afzalzadeh M.R. (2012). Determination of FecXB and FecXG mutations in Kamouri goats of Khouzestan province. Mill. Genet. 12(2), 3529-3535. Hanrahan J.P., Gregan S.M., Mulsant P., Mullen M., Davis G.H., Powell R. and Galloway S.M. (2004). Mutations in the genes for oocyte-derived growth factors GDF9 and BMP15 are associated with both increased ovulation rate and sterility in Cambridge and Belclare sheep (Ovisaries). Biol. Reprod. 70, 900-909. Javanmard A., Azadzadeh N. and Esmailizadeh A.K. (2011). Mutations in bone morphogenetic protein 15 and growth differentiation factor 9 genes are associated with increased litter size in fat-tailed sheep breeds. Vet. Res. Commun. 35, 157-167. Kasiriyan M.M., Hafezian S.H. and Hassani N. (2011). Genetic polymorphism BMP15 and GDF9 genes in Sangsari sheep of Iran. Int. J. Genet. Mol. Biol. 3, 31-41. Knight P.G. and Glister C. (2003). Local roles of TGFβ-super family members in the control of ovarian follicular development. Anim. Reprod. Sci. 78, 165-183. Mehdizadeh Gazooei Y., Niazi A. and Zamiri M.J. (2013). Single nucleotide polymorphism analysis of the bone morphogenetic protein receptor IB and growth and differentiation factor 9 genes in Rayini goats (Capra hircus). J. Livest. Sci. Technol. 1(2), 45-50. Mohammadi G.H. and Alimahmoudi M. (2011). Determination of polymorphism of FecB gene in Najdi and native goats of Khouzestan province by PCR-RFLP. J. Vet. Med. Lab. 3, 13-20. Rashidi A. (2000). Genetic evaluation of economic traits in Markhoz goats. Ph D. Thesis. Tarbiat Moddares Univ., Tehran, Iran. Shamik P., Sachinandan D., Subhasis B., Ramakant K., Paras Y., Jaspreet Singh A., Saibal C., Subhransu P., Biswajit B., Tirtha K.D. and Surender Lal G. (2009). Polymorphism of fecundity genes (BMPR1B, BMP15 and GDF9) in the Indian prolific Black Bengal goat. Small Rumin. Res. 85(2), 122-129. Silva B.D. (2005). Expression of growth differentiation factor 9 (GDF9), bone morphogenetic protein 15 (BMP15), and BMP receptors in the ovaries of goats. Mol. Reprod. Dev. 70, 11-19. Tavakolian J. (2000). An Introduction to Genetic Resources of Native Farm Animals in Iran. Animal Science Genetic Research Institute Press, Tehran, Iran. Wang Y., Yuanxiao L., Nana Z., Zhanbin W. and Junyan B. (2011). Polymorphism of Exon2 of BMP15 gene and its relationship with litter size of two Chinese goats. Asian-Austral-asian J. Anim. Sci. 24(7), 905-911. Wang Y., Zhang X. and Chu M. (2013). Polymorphisms of caprine GDF9 gene and their association with litter size in Henan dairy goat. J. Anim. Vet. Adv. 12(21), 1590-1596. Xue-qin R.A.N., Jian-bin L.I.N., Zhi-yong D.U., Cheng Q.I.N.G. and Jia-fu W.A.N.G. (2009). Diversity of Bmp15 and Gdf9 genes in White goat of Guizhou province and evolution of the encoded proteins. Zool. Res. 30(6), 593-602. Yuanqing H., Xiaoke M., Xiaoyong L., Cunxia Z. and Jun L. (2009). Candidate genes polymorphism and its association to prolificacy in Chinese goats. J. Agric. Sci. 2(1), 88-92. Zhang H.Y., Ding X.L., Ying S.J., Wang Z.Y., Pang X.S., Wang R.F., Chen Q.K., Shi J.F., Zhang H. and Wang F. (2008). 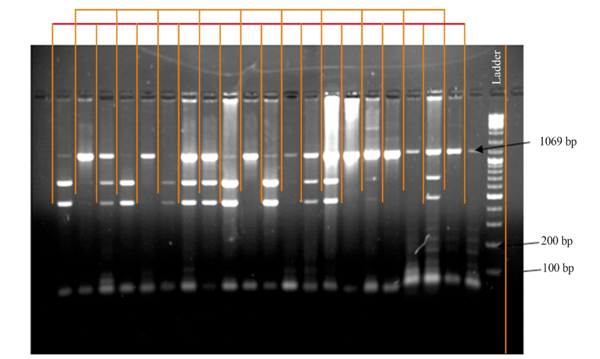 SSCP analysis on exon 2 of GDF9 gene in local goat breeds of Jiangsu province. Jiangsu Agric. Sci. 5, 51-53. Zhu G.Q., Wang Q.I., Kang Y.G., Lv Y.Z. and Cao B.Y. (2013). Polymorphisms in GDF9 gene and its relationship with litter size in five breeds of Black goats. Iranian J. Appl. Anim. Sci. 3(3), 625-628.